Printers just got hacked worldwide. Yes, you heard me right! Wait, don’t fret yet. It wasn’t exactly a hack because no serious damage was done, just a few sheets of wasted paper and ink. The hacker has come forward and revealed his name and told that that the intention was to create awareness among users and to support a Youtuber PewDiePie! A Twitter user by the name @HackerGiraffe, has confessed to the hack but said that it was not for any malicious intent. He wanted to create awareness among online users about leaving network ports open when connected to the internet. They also said that the hack was easy to perform and that they could have caused a lot of property damage to organizations in ink and paper. The script used to execute the hack was extremely short and was sent over to WIRED. 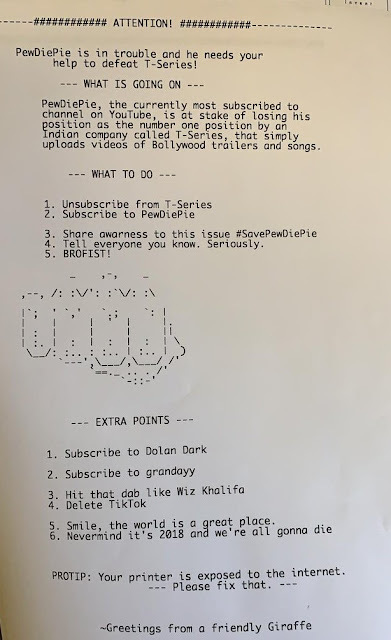 They supported the Youtuber PewDiePie with the content, they had made the printers to print out! Apparently, there is a YouTube feud going on to see who has the most number of followers and PewDiePie is at the top closely followed by Indian Music company, T-Series. The friendly Giraffe got his wish granted and got his favorite Youtuber to get his number of followers upped. But heed to his advice and get that printer exposure fixed!